Pasta primavera is a really great way to get a serving of vegetables and get to eat pasta! Pasta primavera typically has vegetables that are still a bit crunchy, and if I’m being honest… yuck. I don’t want chunks of crunchy vegetables in the way of my tender, delicious pasta. 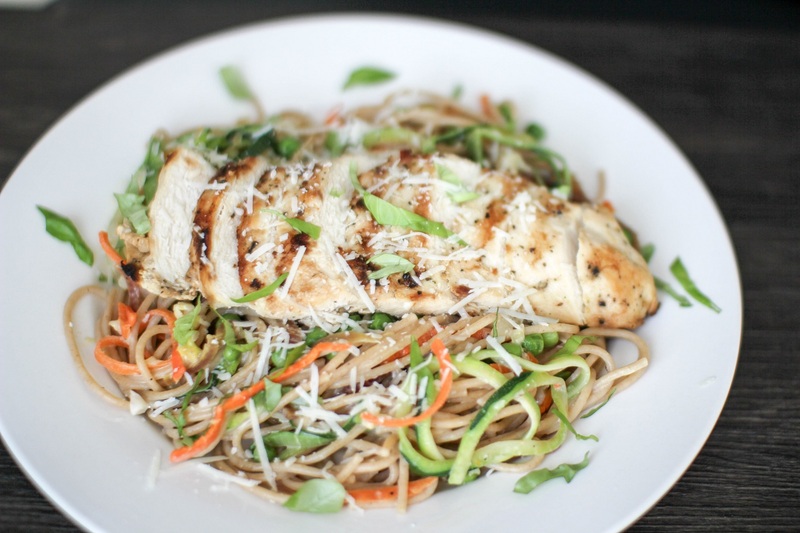 If you spiaralize them it adds another layer of flavor and blends in with the pasta really well and is so delicious. 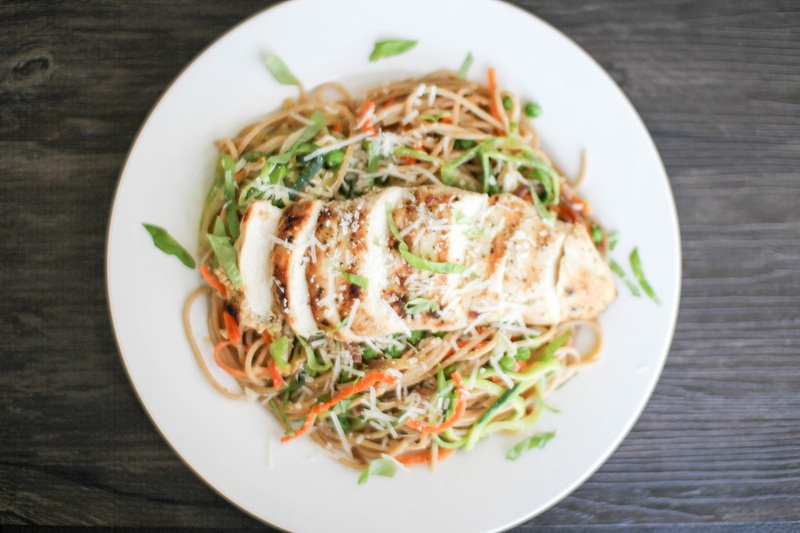 Pasta primavera is usually served with chicken or shrimp on top. I used my 21 chicken that I already grilled a head of time. I think pesto grilled shrimp would also be really great. 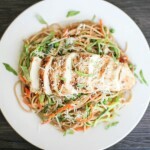 In this recipe the sauce is made in the pasta with left over chicken stock. I got tired of buying chicken stock and when I make it at home it never turns out right. I have actually started keeping on hand chicken flavor pouches from Trader Joes. It’s concentrated chicken stock in liquid form and you just add it to hot water. Break spaghetti in half and place in a pan or pot. Cover it with just enough chicken stock to cook, you will be making the sauce with the little bit that is left over. Put pasta pot on the stove top on high and allow it to boil. 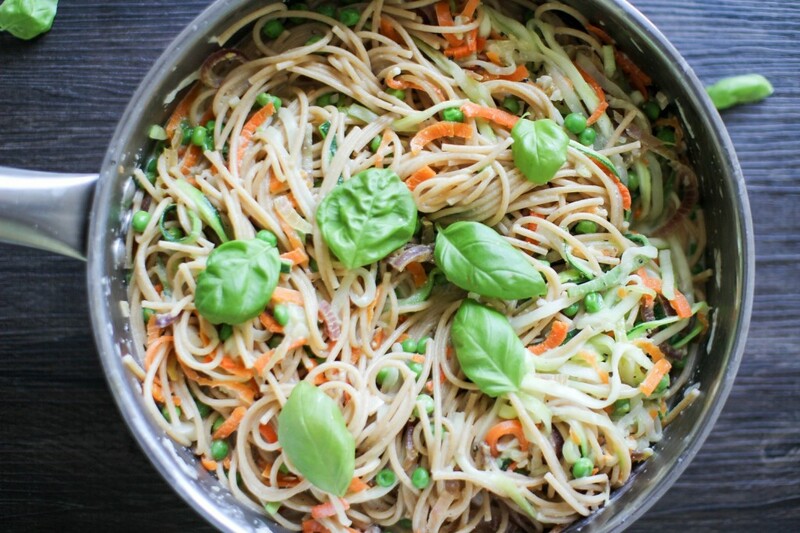 In a separate pan put olive oil, chopped garlic, spiralized zucchini, carrots, and peas over medium-high heat. Cook the vegetables until softened but still slightly firm (about 5 minutes) or to your preference; you may want to use a lid to speed it up. Once the pasta is cooked and most of the pasta water is absorbed/evaporated lower the heat to medium low and add the butter, cream, and cheese and stir vigorously until the cheese is absorbed and it forms a sauce. Add the vegetable mixture along with the vegetable liquid if there is some in the pot. Add lots of fresh basil over top. Serve immediately with chicken or shrimp if you wish. Garnish with more parmesan and fresh basil.